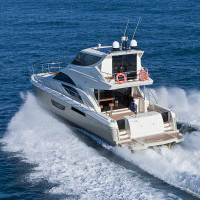 Foreshore Marine Exhaust Pty Ltd is primarily known as innovators of marine exhaust systems. The Foreshore Inline Muffler is the flagship product of the organisation and has been manufactured in Australia since 1993. Boat builders worldwide have been installing these mufflers because of their superior design, best possible noise attenuation, improved performance ,cost effectiveness and class compliance. Through their unique design, they retard sea water surge towards the marine engine. The Foreshore Marine Exhaust Inline Muffler was originally developed for the Detroit 2-cycle marine engine. From the early 1990’s and currently, these engines are the loudest marine engines in the marketplace. The Foreshore Inline Muffler forces hot exhaust gas through a dedicated water baffle to deliver maximum noise reduction. Foreshore Marine Exhaust Pty Ltd uniquely offers different product configurations to cater for all makes and models of engines in both petrol and diesel. The Foreshore Inline Muffler can be customised to meet client specific requirements as we understand that “one design does not fit all”. All mufflers are optimised and tuned to our client’s cruising speed and personal audible tolerances. Variations of the Foreshore Marine Exhaust Inline Muffler include twin inlets, jet installations combining a surge tube, stern drive installations and underwater exhausts. All mufflers are built with Lloyds Register and Det Norske Veritas approved materials. All mufflers carry a limited three  year warranty and 24/7/365 technical support. Sizes are stock items only. Foreshore Marine Exhaust Pty Ltd can manufacture all client specific sizes and configurations.